Recently I was sent some items from Milani Cosmetics to try out and review. I have to say that Milani is one of my favorite lines. The line itself originally started out as a line for women of many ethnic origins who did not have as many choices on the cosmetics scene, Latina women mainly. Milani Cosmetics' colors are extremely pigmented, they are bright and bold and the quality of the cosmetics are extraordinary. That is why I love the brand so much. They have stayed true to their focus over the years but have branched out to include women of many skin tones, from the extraordinarily pale to the (like myself) to the very rich and dark. Below please find the reviews for several new items that have come out recently. These items are for everyone and are good, basic items to have in your kit. I hope you like the reviews and if you have any questions, please email me at mariepapachatzis@gmail.com. 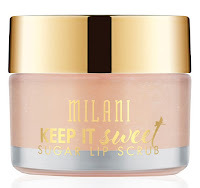 Milani Keep It Sweet Sugar Lip Scrub smooths and exfoliates lips for an instant polished and revitalized lip look. Natural sugar granules soften skin with a kiss of sweetness, leaving lips feeling nourished and prepped for color. 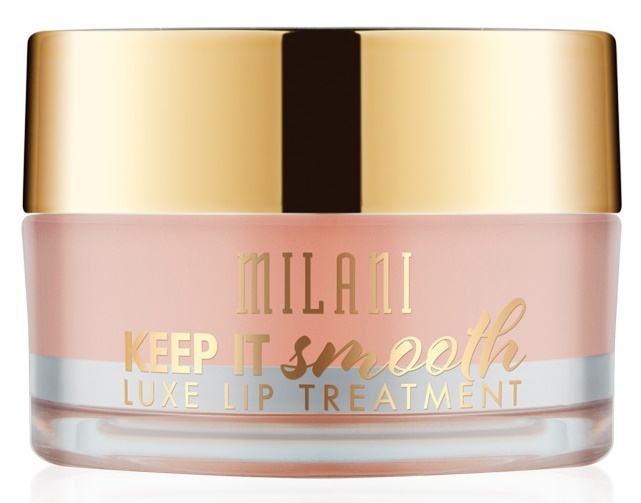 Use 2-3 times per week and follow with Keep It Smooth Luxe Lip Treatment for the ultimate lip luxury experience. Apply a small amount with finger and gently massage onto lips to buff away dry flakes. Tissue off. Lips will be soft and smooth. I found this product to be amazing. The sugar granules are gentle and buff away the flakes easily. I have been using a lot of matte lip color lately and my lips have been very dry. This has been their savior all winter! 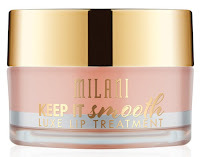 Milani Keep It Smooth Luxe Lip Treatment restores your dry lips and prevents lips from becoming chapped with deeply moisturizing Shea Butter and six ultra-hydrating Oils, coconut, olive, sweet almond, macadamia, jojoba, and Argan. The smoothing and soothing treatment provides instant comfort, day or night, fines lines are minimized and lips are kissably soft. This is so much better than any regular lips balm. It is a treatment. I use it at night right before bed so that my lips get the benefit of all of the oils overnight. I also like to use it underneath a matte lip color to keep it from making my lips be chapped at the end of the day, so I might use it underneath my lip liner. I just pat it on a little bit on the lips before I use the liner. With just one swipe, Keep It Clean Longwear Lip Color Remover erases every trace of longwear, matte and metallic lip color. The gentle yet effective, hydrating formula leaves lips feeling extra soft, nourished, restored and revitalized. 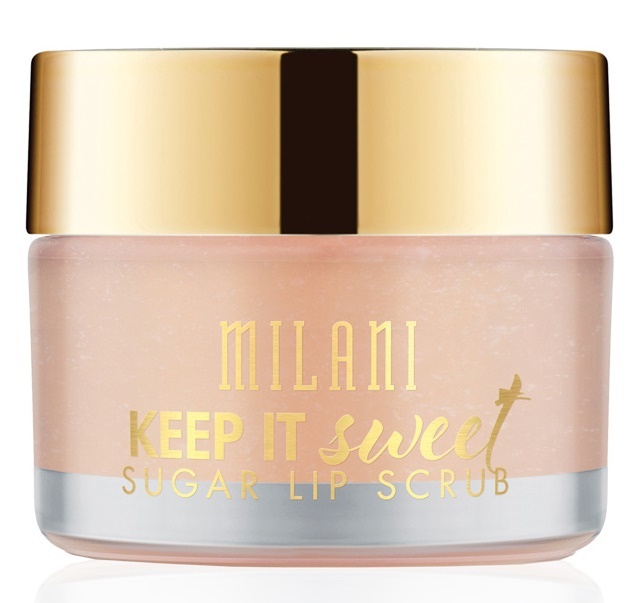 Follow with Keep It Sweet Sugar Lip Scrub and Keep It Smooth Luxe Lip Treatment for a truly indulgent lip experience. Apply a small amount with finger and gently massage lips to remove color. Tissue off. Repeat if needed. This really works. I have longwear lip color that sometimes does not want to come off my lips and stains them. This actually removes all traces of the lip color, including all pigment. Lock in your makeup and keep that just applied look all day and into the night, no touchups needed! Make It Last Setting Spray primes, corrects and sets your look for up to 16 hours without a crease or smudge in sight, and prevents fading and shine. Spray under or over makeup, or wear on its own for a beautifully matte, flawless face. To use, hold bottle 8-10 inches away from face and spray in zigzag formation. Do not spray directly into eyes. This really does help to set makeup. I find that when I use it, my makeup lasts longer, resists fading and does not crease or smudge at all. I love the way this helps set my makeup for the day. 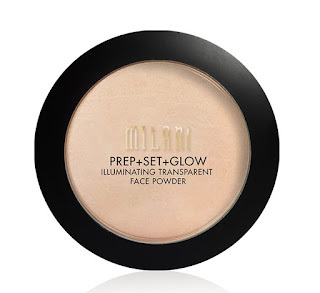 An on-the-glow primer, setting powder and illuminator in one! Prep + Set + Glow Illuminating Face Powder delivers a natural healthy glow, blurs the look of imperfections, sets makeup and adds all-over radiance. The lit-from-within finish is flattering on all skin tones and skin types. Wear under foundation to prep skin, over to lock in makeup. Luminescent finish. Silky, lightweight feel. I love the way this powder makes my skin look. It ends up looking glowing. I use it over foundation, as that is the best way for me to get the glowing look. If you are not wearing any foundation, you can still wear this and get a nice glowy look. Or, wear it to prep your skin for foundation. Either way, it is a great powder. Crafted on Italian terracotta tiles, Baked Bronzer is all about a streak-free glow with a slight shimmer finish. Choose from soft gold to tantalizingly tan and dust it lightly on face and body, anywhere and everywhere you want to glow. It comes in three shades: Glow (light gold tan with gold shimmer), Soleil (medium gold tan with gold shimmer) and Dolce (light natural bronze). Glide brush over color and lightly tap off excess powder. Lightly apply to cheeks, forehead, chin and/or nose and blend well for a soft glow. I tried Dolce. It is a beautiful color, does not look overly bronze on the skin. It looks golden in color with a beautiful glow. 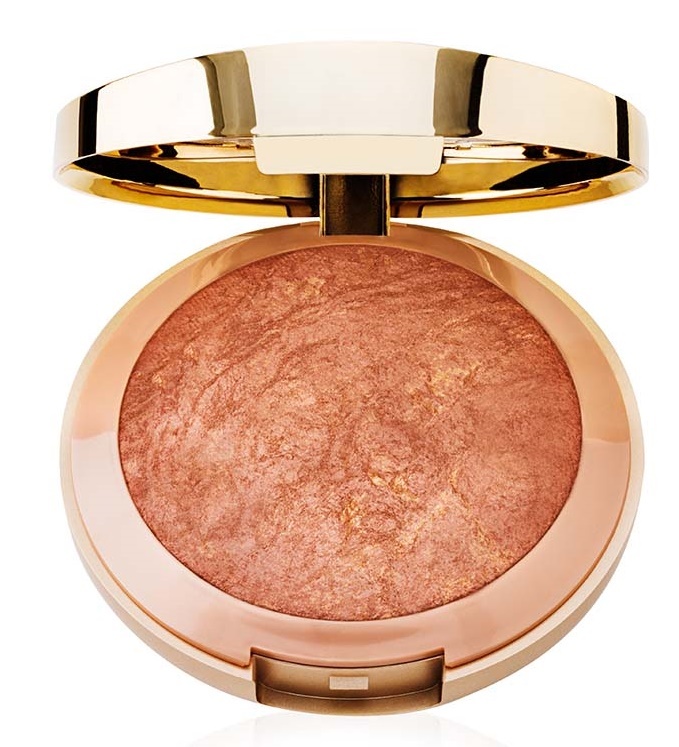 I love Milani's Baked Bronzer because the pigment is not overly heavy, as it has been baked on the terracotta tiles. Dolce is the newest color and is just gorgeous. Turn on your glow! Strobelight Instant Glow Powder makes strobing and highlighting easy from those who are beauty novices to experts alike. Light-reflecting pearls create a radiant finish that define your features with a healthy, warm glow. Available in a range of shades to flatter every complexion. Sweep underneath brows, inner eye area, the cupid's bow, above your cheekbones, center of forehead, bridge of nose and anywhere you want an instant highlight. It comes in seven shades, two of which are new: Dayglow (champagne pearl) and Sunglow (sand pearl). The other shades are Afterglow (pale pearl), Glowing (bronze pearl), Sunset (rose gold pearl), Moon Glow (light pink pearl) and Summer Glow (white gold pearl). 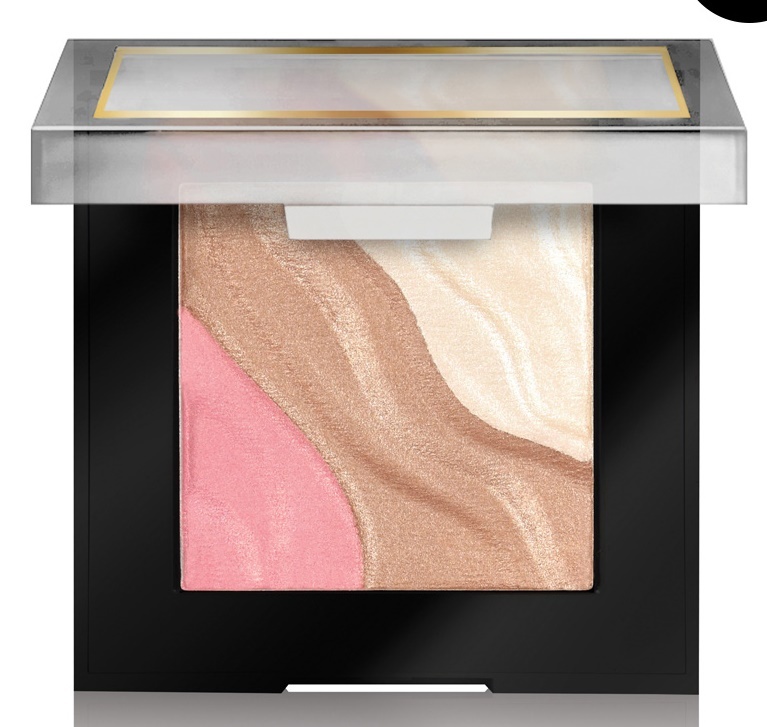 Spotlight Face & Eye Strobe Palette is the ultimate multitasking glow powder with universal flattering shades to illuminate face and eyes like never before. Light-reflecting powders build and blend effortlessly for an instant glow. 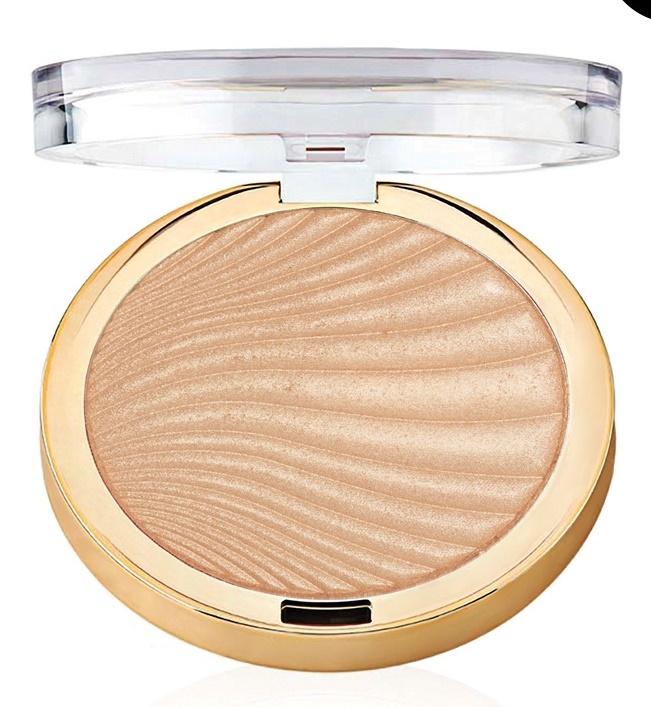 Use as a blush, highlighter, eye accent and to spotlight all of your prettiest features with beautiful luminosity. Apply shades individually to desired areas or swirl together for a flawless strobe effect. It comes in three shades: Sun Light (Pale Pink/Neutral Bronze/White Pearl); Candle Light (Coral Pink/Bronze Glow/White Gold Pearl) and Golden Light (Warm Bronze/Deep Bronze/Light Bronze). I tried Sun Light and Candle Light. Both are extremely pretty on. There are three shades in each compact so that you can use the blush, bronzer and highlighter in each to do their job or swirl them around and have one big color to make a blush or highlighter. They are nicely pigmented and do their job well. See below to see how the Sun Light compact looks. Richly pigmented and highly buildable, the beautiful matte and shimmery shades of Baked Blush are the perfect cheeky pop of color for every skin tone. 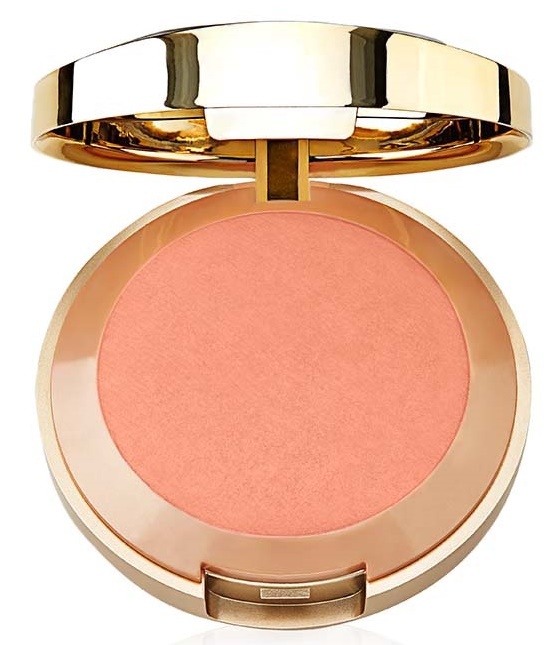 Sunbaked on Italian terracotta tiles, the warm finish adds a radiance that is the very essence of beauty. Shape, contour and highlight your best features. Glide brush through color and lightly tap off excess powder. Lightly apply to cheeks, forehead, chin and/or nose and blend well for a soft glow. It comes in eleven shades, including two new ones. The two new ones are Bella Bellini (rose gold) and Rosa Romantica (light pink). The other shades are Dolce Pink (pink with gold shimmer), Rose D'Oro (soft rose with a golden glow), Berry Amore (berry rose with gold shimmer), Luminoso (luminous peach), Bellisiomo Bronze (golden bronze), Corallina (shimmering vivid coral), Red Vino (berry red with gold shimmer), Delizioso Pink (matte bright pink) and Bella Rosa (matte bright raspberry pink). The Milani blushes are just fabulous. So many pretty colors to choose from and they all go on beautifully. I just love them all. Each color is highly pigmented. Remember, add on a little blush at a time, you can always add but it is harder to take off! The best thing about Milani blushes is that almost all of them are warm shades so they add a warm glow to the skin. Even the cool shades usually have gold shimmer in them or a warm undertone in them to make your face have a beautiful warm pop to it. Contour & Highlight Cream Liquid Duo is a smooth, blendable matte contour cream and high pigmented liquid illuminator in one that lets you effortlessly create a sculpted and highlighted look with the perfect shade combination for your skin tone. The lightweight, buildable shades add major glamour to any makeup or no-makeup look. Or, it adds soft-glam, natural-looking definition to your best features. The contour stick adds depth and definition. To apply contour: under cheekbones, jawline, along hairline, sides of nose, and then blend. Highlight liquid adds a subtle glow. Apply it above cheekbones, bridge of nose, below and above lips, center of forehead, and then blend. It comes in five shade combinations. I tried two of them. 02 (Light/Natural) and 04 (Medium /Dark). There is also 01 (Fair/Light), 03 (Natural/Medium) and 05 (Deep/Dark). Contouring and highlighting is still very in. It will be for a while. It is a good idea to contour and highlight your face to bring out your best features. With this Contour & Highlight Cream Liquid Duo, you can easily contour your face and highlight it in minutes. Ideally, 01 (Fair/Light) would be ideal for me, as I am very pale and need the lightest highlight. The 02 (Light/Natural) shade works for me too as I need some darker contour to work with also. The photo below shows the two colors I tried and how they look. Retouch + Erase Light-Lifting Concealer instantly erases the look of dark circles, spots, blemishes and imperfections with an added face brightening effect. Achieve flawless color correction through light technology—like a face-perfecting filter with a smooth, undetectable finish. A mess-proof cushion tip applicator blends the lightweight, full coverage formula over skin easily without creasing or settling into fine lines. Gently squeeze and apply concealer to under-eye area to hide dark circles, cover blemishes, spots and imperfections. Comes in six shades: 01 Fair (fair with pink undertone), 02 Light (light with neutral undertone), 03 Medium Light (medium light with golden undertone), 04 Medium (medium with peachy undertone), 05 Honey (medium beige with peachy yellow undertone) and 06 Deep Honey (deep beige with cool undertones). I received 02 Light, 04 Medium and 05 Honey to try out. 02 Light was the color that best matched my skin tone. This is a very nice concealer. It does exactly what it says it will do. It helps to cover up dark circles and imperfections very well. It brightens up the skin, all without being detected. The concealer blends in very nicely. The no-mess applicator is perfect. It makes application a breeze and makes it no-fuss and you don't even get your fingers dirty! Stay Put® Waterproof Eyeliner Pencil features a waterproof gel formula and super-saturated pigments in a wide range of shades, from intense black to a bold yet flattering sapphire blue. Color glides on, stays creamy for blending, and sets quickly for transfer-resistant, all-day wear. Apply along lash lines from inner to outer corners of eyes. This eyeliner comes in five shades: Linked On Black, Stay With Slate, Hooked On Espresso, Fixed On Plum and Keep On Sapphire. I received three of them to try out: Stay on Slate, Fixed On Plum and Linked on Black. What I like about them is the gel formula. It makes them easy to apply so that they glide on nicely and then once they dry they are transfer resistant. These eyeliners are waterproof, even against my teary eyes. I have one eye that tears up all the time and this eyeliner holds up against it. Most liquid liners that say waterproof don't do that. That's it for today. I know that was a lot of stuff to digest. I hope you liked my review on some of the latest Milani Cosmetics. Milani can be found at Walgreens, CVS and online at www.milanicosmetics.com. If you'd like, try the store locator to find Milani near you: www.milanicosmetics.com/storeloc_rlj.php. Like Milani on Facebook: https://www.facebook.com/Milani; Follow Milani on Twitter: @milanicosmetics; Follow Milani on Pinterest: https://www.pinterest.com/milanicosmetics/; Follow Milani on Instagram: https://www.instagram.com/milanicosmetics/; Add Milani on Snapchat: https://www.snapchat.com/add/milanicosmetics and Subscribe to Milani on YouTube: https://www.youtube.com/user/Milani.